I made these things to give as gifts this Christmas, finishing the dishcloths today. <<< My sister told me her daughter would like a grey and pink bag like the one I gave her last year, but this time with a zig zag or polkadot pattern. So this is what I came up with! It’s my own pattern and required a second attempt, the first one was just to work it out, then it got unravelled! The pattern is basically a sl st, sc, hdc, 3 dc, hdc, sc, sl st repeated, every second row does the same pattern but inverted with the sl st falling on the middle dc, if you know what I mean! Two rows one colour then the next two rows the other colour result in these wavy stripes. Otherwise, it’s a pretty straight forward bag, with a row of dc in the handle. 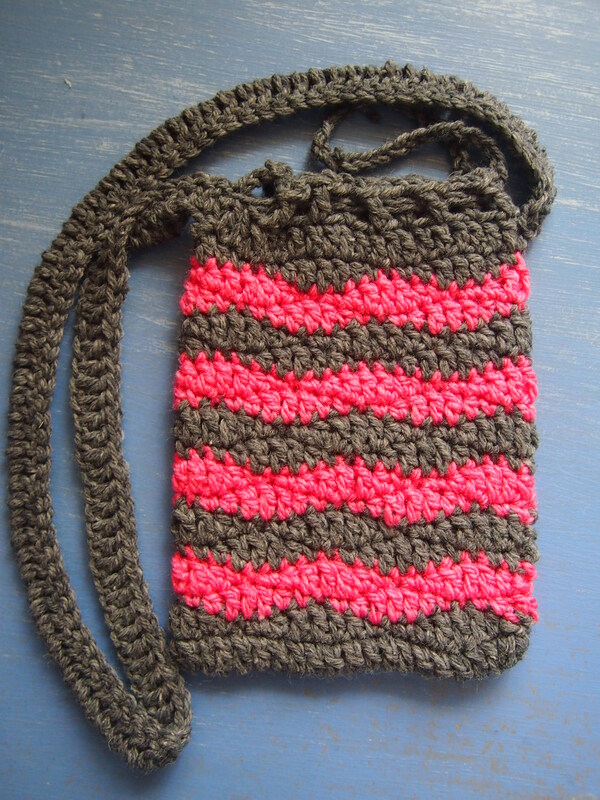 I think I used a 4mm hook, I really like the pink I used its a vibrant colour, and some dark grey wool. >>>My favourite soap is the pink Dove soap, its a pink ribbon fund raiser and is very nice, soft and creamy. 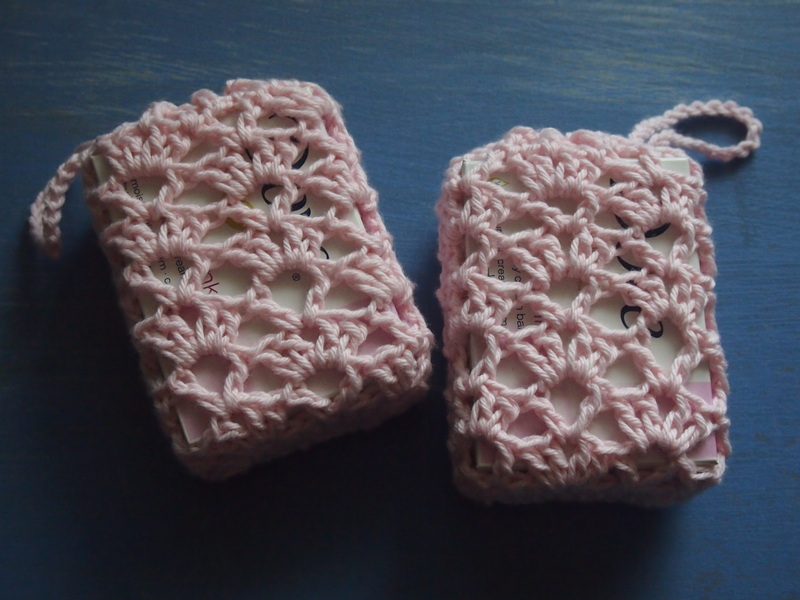 I decided to use some pretty pink cotton I have left over from the sun hat I made for my niece last year, to make some pretty soap savers! Again, I had to have a second attempt, the first go I worked out the pattern then had to unravel it and start again properly. I started at the bottom with 9 ch, then a dc in every ch, 3 extra at each end, then another 9 on the other side of the ch to make a round. After that there are 7 rows of lace, the pattern is 2 dc 1 ch 2 dc, sk 2, 1 dc 3 ch 1 dc, sk 2, then alternated into the sp, if you know what I mean! Then the top is 1 dc 1 ch, and a ch threaded through and sl st onto itself to make a closed tie handle. I used a 3.5mm hook and a 50/50 cotton and acrylic blend. I hope the recipents like these, I think they’re really nice anyway! 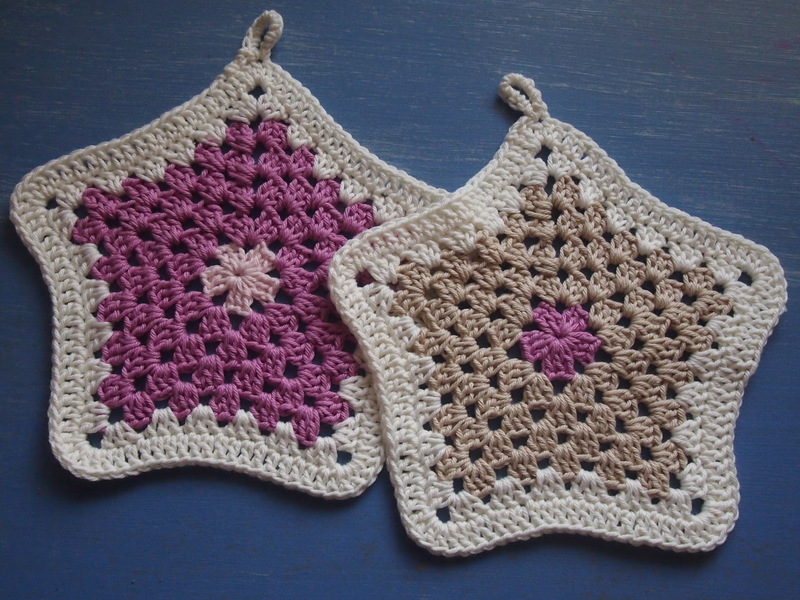 <<< Today I finished these pentagon dishcloths using up the last of the pretty 50/50 cotton acrylic blend. It’s so sad to see the last of it go! Again I used the 3.5mm hook, and my own pattern. This is like other pentagon dishcloths I’ve made, but slightly bigger as my husband has said they need to be! If I didn’t run out of cotton they would be even bigger! 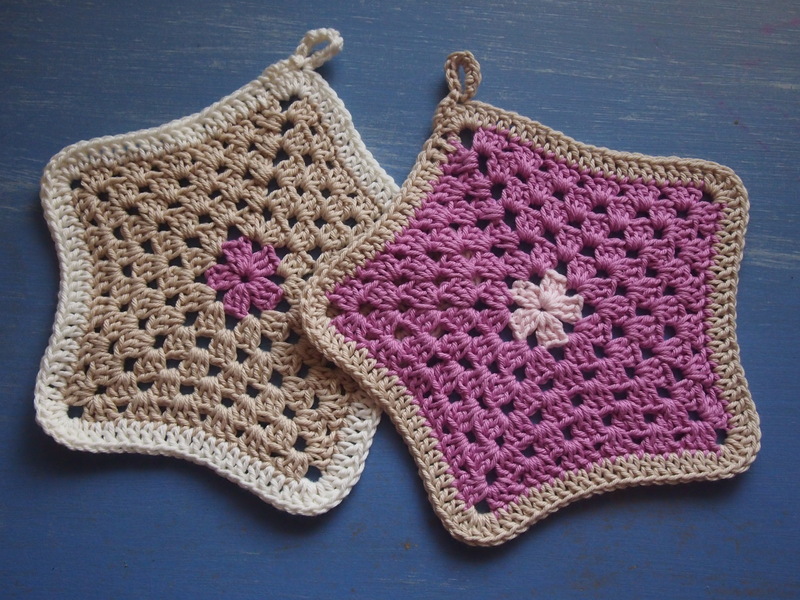 I’ve made these for people who mentioned they’d like home-made dishcloths, I hope they like these!